With equities seeing minor weak chop across the day, the VIX managed a minor gain for the second consecutive day, settling +2.6% @ 12.09. 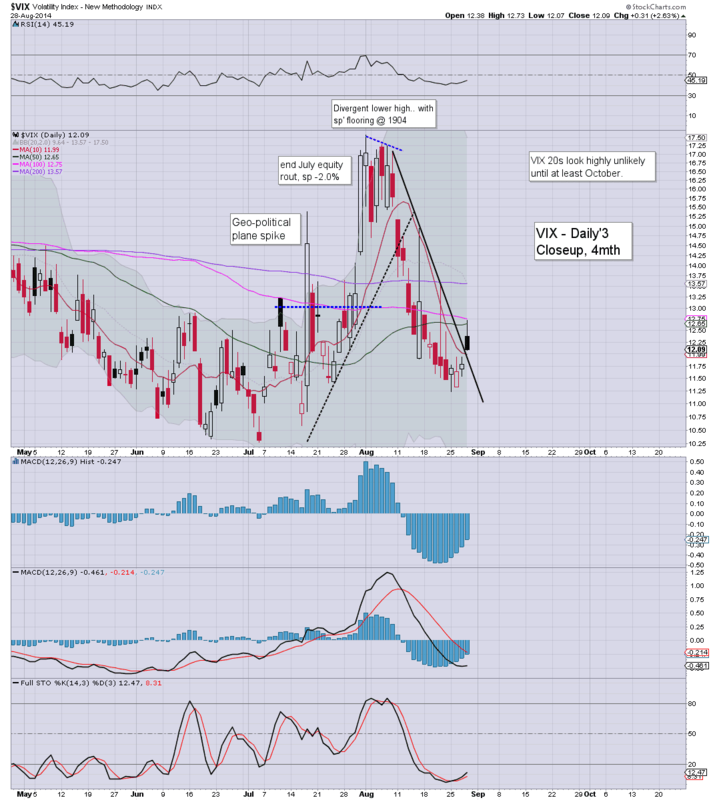 Near term outlook is for VIX to remain within the 13/10 zone. The 20s look highly unlikely until at least October. It is notable that the broad down trend from the 17.50s was today broken. However, we're still a good 2-3 days away from a bullish MACD cross..and that would likely require sp'500 to remain under the big 2000 threshold. 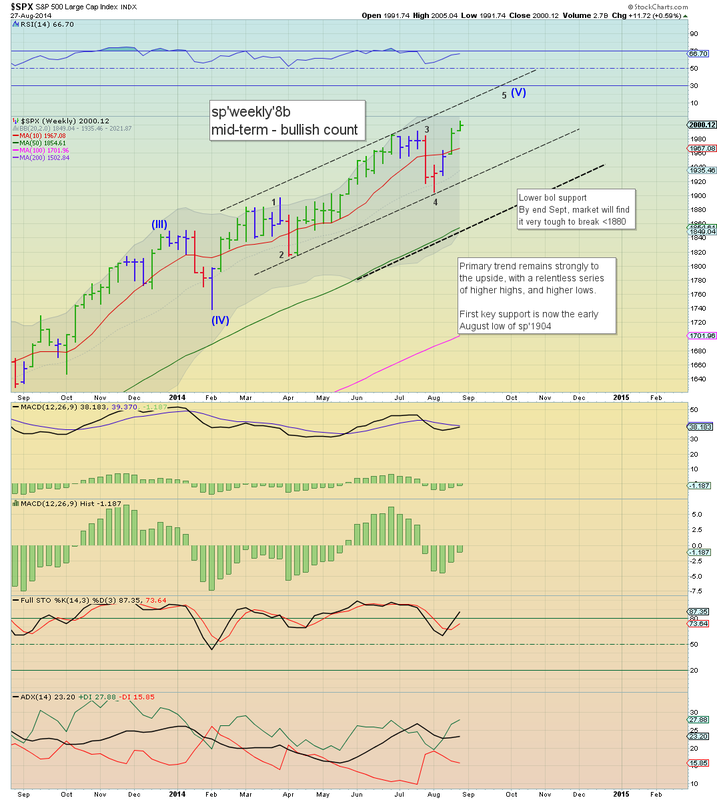 The equity monthly cycles have powerful net monthly gains, and it bodes for further upside into September. If that is the case, then VIX will remain very subdued for at least some weeks to come. Right now, it is arguable that VIX won't break into the 20s, even if the market slipped to test the recent low of sp'1904, and that sure doesn't look feasible until at least October. US equities closed a touch weak, sp -3pts @ 1996. The two leaders - Trans/R2K, settled lower by -0.3% and -0.6% respectively. Near term outlook offers a chance at a further wave lower to 1985/80, but the primary trend remains very... very strong. Little to add, on what was a very... very quiet day. *I hold long overnight, via SDRL.. which managed a moderate gain. 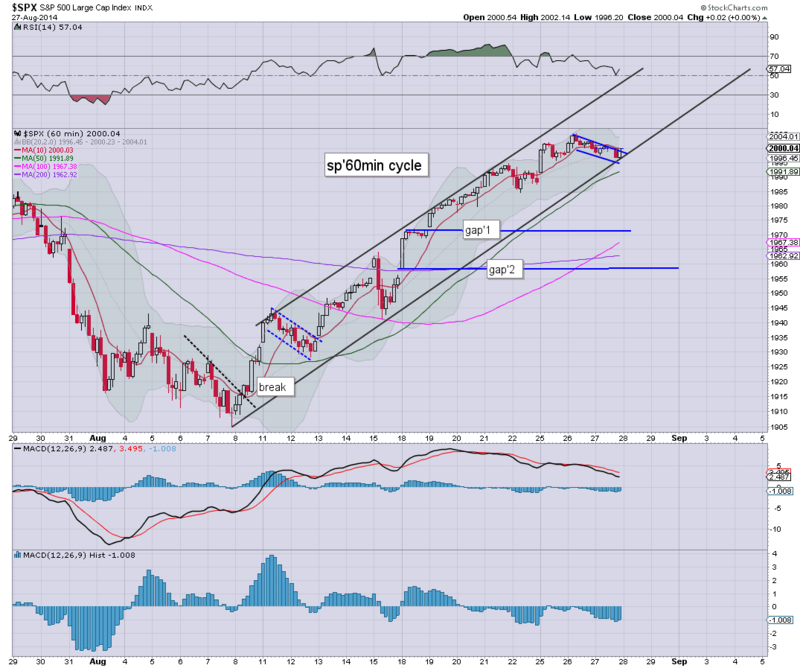 Equities continue to trade within a very tight range, with the sp'500 set to close in the upper 1990s. No doubt some will be getting overly excited that the market failed to close in the 2000s.... the reality is that it is of no consequence. Primary trend remains the same. Little to add...on what was just another day closer to the long weekend. Notable gains, CHK +2.3% in the $27s... 30/32 seems viable in this new up wave. *SDRL +1.1% in the low $37s... which I will hold overnight..and probably across the first half of next week. 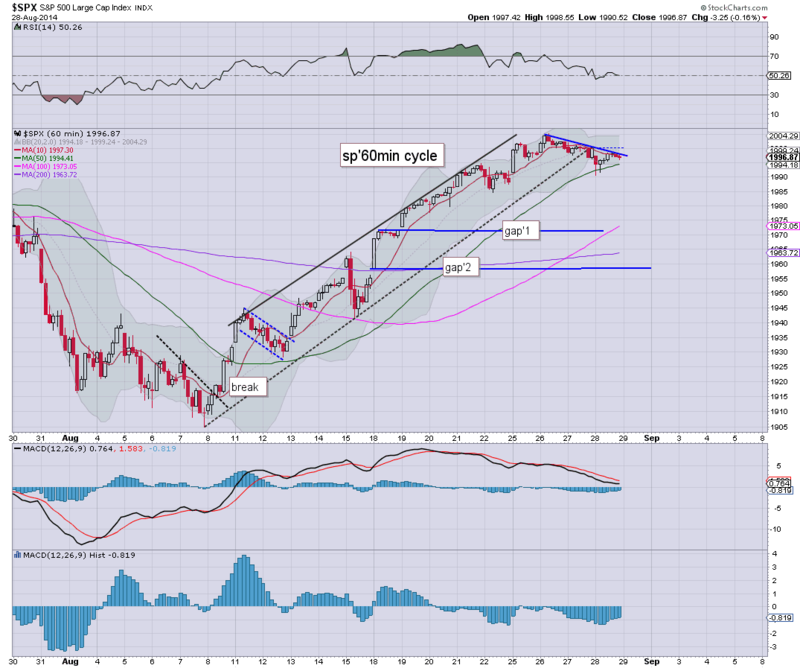 Equity indexes continue to attempt to claw back to positive.. which still seems very viable. VIX is holding minor gains of 2% in the low 12s. Metals holding gains, Gold +$7. Oil is +0.7%. I suppose you could argue micro price structure is offering a baby bear flag... with a small wave lower early tomorrow to sp'1985/80 zone. Regardless...August has arguably been the best month of the year for the bull maniacs. Sept' looks due for further gains. Equities are clawing higher from the early morning low of sp'1990, with most indexes set to turn green this afternoon. Metals are holding moderate gains, Gold +$8. Oil is +0.6%. There is little to add... a quiet afternoon is ahead. There are a few pieces of econ-data tomorrow morning, notable the Chicago PMI, but most will have already turned their screens off for the long weekend. US equities remain slightly weak, but with the smaller 60/15min cycles all floored, there remains high probability of indexes turning positive this afternoon. 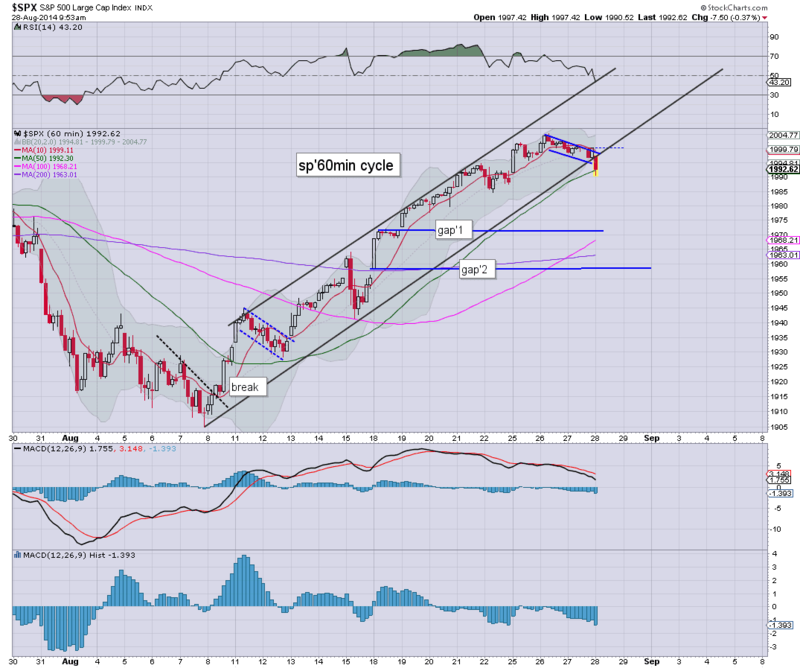 Regardless of the minor noise... August is set to close with powerful gains for all indexes. It is probably more interesting to watch the ice on top of Bardarbunga volcano in Iceland. 11am update - was that it? Little to add..., and with GDP out of the way, there is zero reason why price action won't remain largely flat for the remainder of the week/month. We're at the typical morning turn time of 11am...and that probably is it for the bears. notable strength: TWTR +3.4% @ $49.60s... a break >50 will open up 58/60. US indexes open moderately lower, with the sp' in the low 1990s. Metals are holding gains, Gold +$10. Equity bulls could sustain the low 1970s.. and it does nothing to dent the rally from 1904. 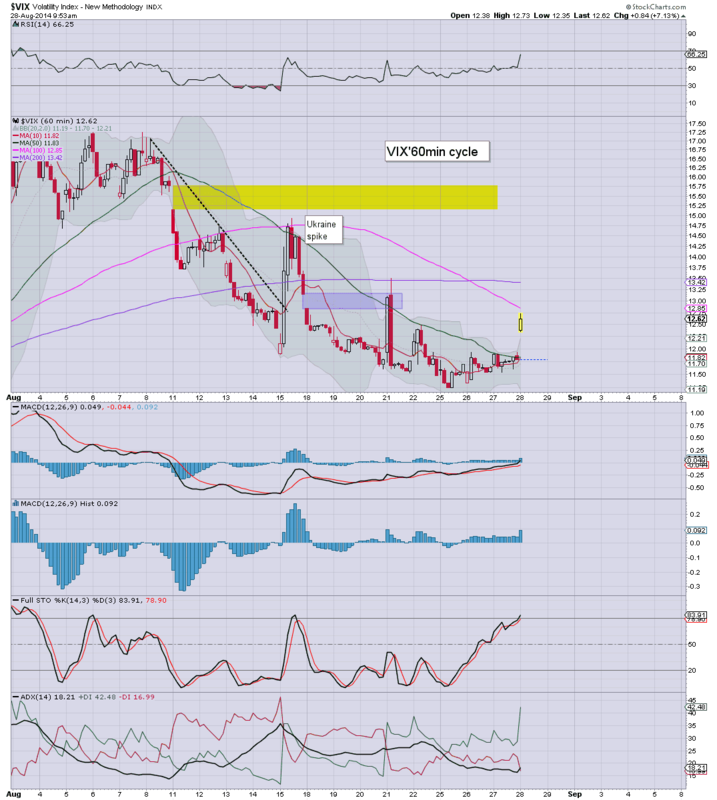 *there is a clear gap zone in the VIX.. the 15s, but that looks out of range. Well....despite a far better GDP number than could have been expected, market is seeing a minor down wave. At best...bears will see the market floor around 11am. What matters is the broader trend..and that is strongly to the upside. 10.27am... Equity bears failing (somewhat embarrassingly) to even break 1990. With GDP out of the way, there is nothing now until next week... aside from a few minor 'end month' trading issues tomorrow afternoon. Good morning. Futures are moderately lower, sp -7pts, we're set to open at @ 1993. Metals are strongly higher, Gold +$14, with Silver +1.6%. *GDP (second reading): 4.2%... a somewhat surprising upward revision from the initial 4.0%. Hourly bull flag.. set to fail at the open. If the market does sell lower, then we've two clear gaps lower down, although the second one @ 1958 is a relatively long way down. 9.48am... hmm...clear break of the up trend.... sp'1992... but still, we're only talking -0.4%..barely rates as 'moderate'. It was just another quiet day in market land, ahead of a three day holiday weekend. 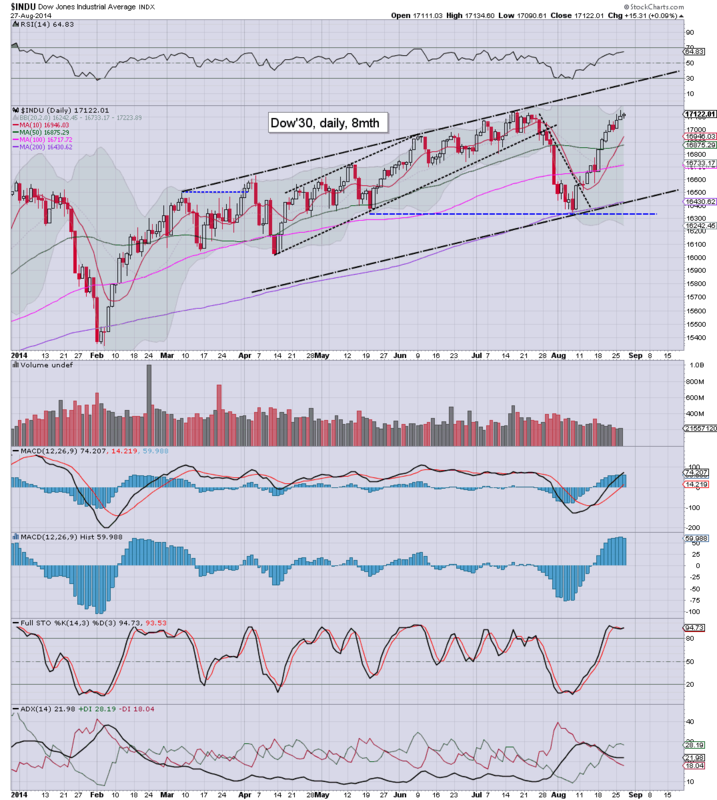 Price action remains relatively muted, but the broader daily, weekly, and monthly cycles are all 100% bullish. Really, there is very little to be said. Green candle... bullish into September. We've a long weekend ahead (US markets are closed next Monday)... and there is little reason why trading volume will not continue to decline. The only issue is late Friday when there is a rebalancing, along with other end-month trading issues. Overall, for many...it is arguably a case of switch your screens off, and come back next month. Thursday will be largely about the second reading for Q2 GDP. Market is expecting an unchanged 4.0% number. *next QE-pomo is not until sometime next week. Maybe its just me, but I sure have seen a lot of doomers being wheeled out across clown finance TV in the past few days. 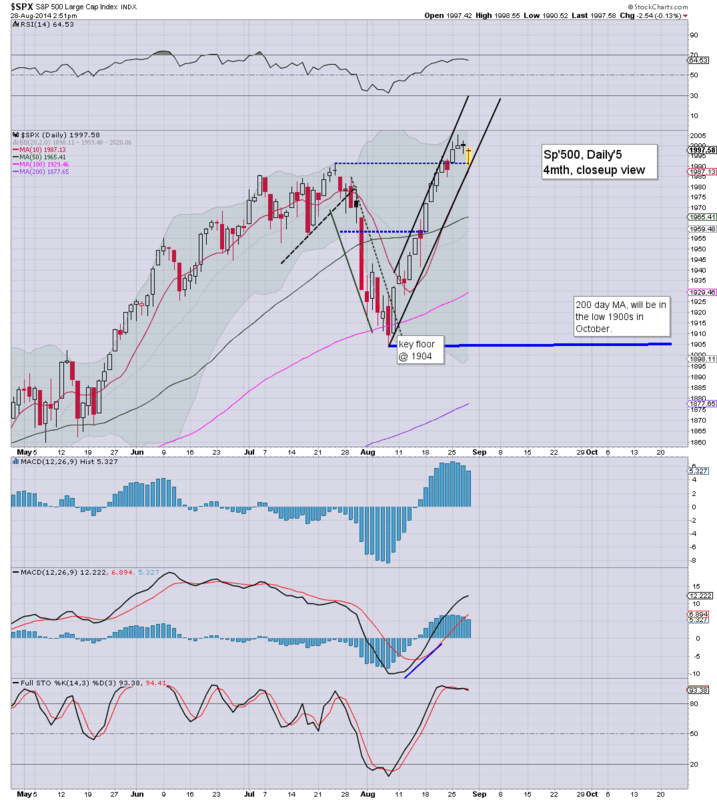 There has been talk of sp'1000, 800, or even lower... it all seems like crazy talk, even to me. 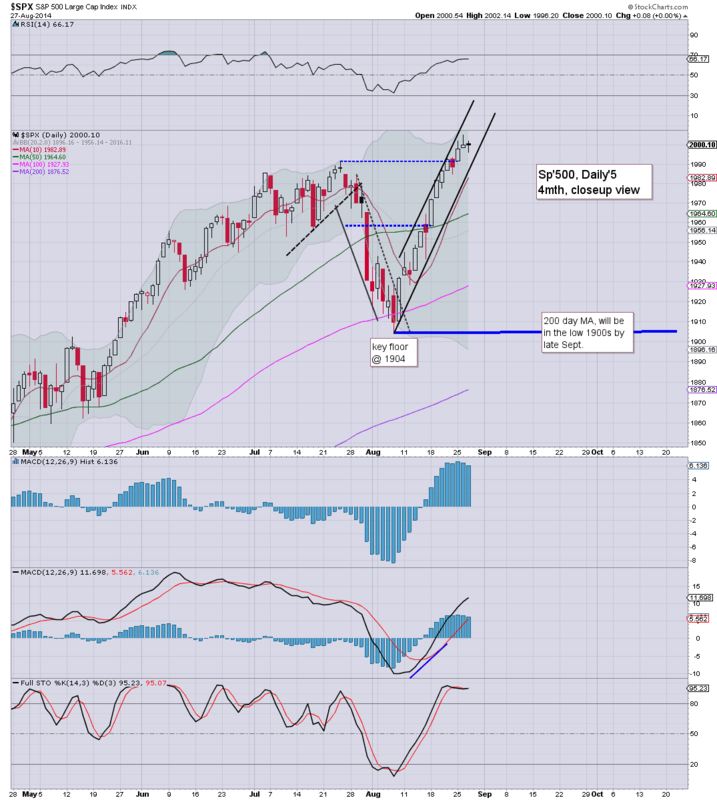 The monthly (US, and many world markets) charts - as I highlighted just yesterday, are very bullish for September. Typically, we'd hit the upper monthly bollinger before a major correction, and that is in the 2050s right now. Is the latest bout of doomers on clown TV just another sign that we're far from 'bear capitulation' or 'bull euphoria? All things considered, I'm resigned to at least another 2-3% higher in the near term. US equity indexes closed moderately mixed, sp'500 u/c @ 2000. The two leaders - Trans/R2K, settled +0.1% and -0.2% respectively. Near term outlook is for continued upside melt into early September. The broader daily/weekly cycles remain very bullish... with the giant monthly cycle especially bullish for September.